“Congratulations! It's A Boy! God’s Gift: A Story of Love” from Christian Faith Publishing author Dale Anthony and Rachael Anthony is a moving story about the love children bring into a family and the connection families have to God. “Congratulations! It's A Boy! God’s Gift: A Story of Love”: a children’s book that shows the value of children to both their parents and God. “Congratulations! It's A Boy! God’s Gift: A Story of Love” is the creation of published authors, Dale Anthony and Rachael Anthony, a couple from Long Island, New York. 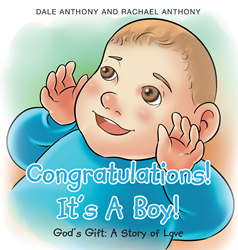 Published by Christian Faith Publishing, Dale Anthony and Rachael Anthony’s new book is a perfect gift for any new or expecting parents about the gift from God that is a baby boy. Inspired by the authors’ own godson, this book illustrates the relationship that a family has with the Lord. This story shows the spiritual and emotional value of children to new and recent parents. Moving text is accompanied by illustrations of the story that make this book an ideal gift for special occasions such as baby showers, baptisms, and christenings. View a synopsis of “Congratulations! It's A Boy! God’s Gift: A Story of Love” on YouTube. Consumers can purchase “Congratulations! It's A Boy! God’s Gift: A Story of Love” at traditional brick & mortar bookstores, or online at Amazon.com, Apple iTunes store, Kobo or Barnes and Noble. For additional information or inquiries about “Congratulations! It's A Boy! God’s Gift: A Story of Love”, contact the Christian Faith Publishing media department at 866-554-0919.